Kate E Lore wearing jammies. Shirt is over-sized black Tower of Terror featuring black and white Donald Goofy and Micky from back in the Orlando days. Had gotten super cheap from the employees only discount damaged merchandize and out of season store. The bottoms are pink Tweety that my mother got me for Christmas. I don’t really like Tweety and the pink and black clash but comfy clothes is comfy clothes. Miku and Teddy are here and I guess kinda my roommate Mel-dog and her cat Mia. I am sitting on my bed these blankets on the floor. 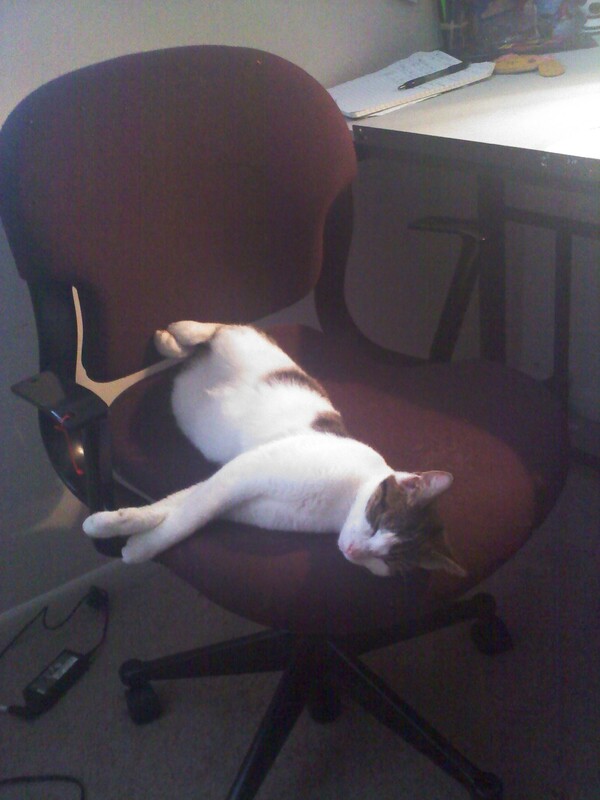 Miku has claimed the desk chair thus preventing me from sitting at the desk. She had purred so happily when I petted her to wake her up that I lost all will to move her. To my right is the wall covered in drawing paper -well half covered. I expected this to be covered in drawings and explosions of self expression, release of tensions, and various memorials to various adventures. Instead this wall so far has mostly messages. Scribbled to do lists in crayon, forced motivation and encouragements mostly in ink. I miss the comfort and familiar setting of being at my mothers home. I miss knowing exactly what was going on with all my people in Dayton. I miss having so many friends that there was always somebody I could invite to go with me some place. I miss Zell. I genuinely like blogging and initially I just wanted to share this silly make-do salad I created. Perhaps this blog is becoming an empty figure I can talk to. Maybe this can be an escape out of making new friends. I’ve come to realize it took me a while to be good friends with the people I am good friends with. I am a frozen thing that must sit on the counter for hours before I’m thawed out comfortable good to go. It seems such an effort and my instinct to distrust and assume people dislike me is perhaps stronger than normal. I’m still adjusting to life here. I’m not financially stable and it’s a constant throbbing pain. It’s a back of your head ache that won’t let you forget and interrupts your focus. I don’t have any sort of security net. I’m swimming alone. The shore drops off before I expected and suddenly I’m free swimming through this deep water. And it’s cold and it’s dark. Or maybe it’s too bright with light bouncing off the surface that I can’t see. I know I can make it and I knew the first couple of months would be rough. I should just stop bitching… I’m bored sometimes. And despite the words written on my wall I do occasionally feel discouraged. I’m a human being I find myself telling people more and more frequestly. It’s the best excuse in the world even though I don’t feel all that human half the time. I used this roman lettuce my mom gave me for free as it was grown in her garden. She had also given me some fresh garden radishes but I’d received that a week prior so I froze them to last. I’d also frozen some ginger left over from prepackaged Sushi from Tensuke Market. I thawed out the frozen stuff and used all three to create my salad. I added just a little thyme which I got for free and is kinda the only seasoning I have. I added pepper because I do have salt and pepper. I used Italian dressing because dammit that’s my dressing of choice and you can cook vegetables and marinade with it too. 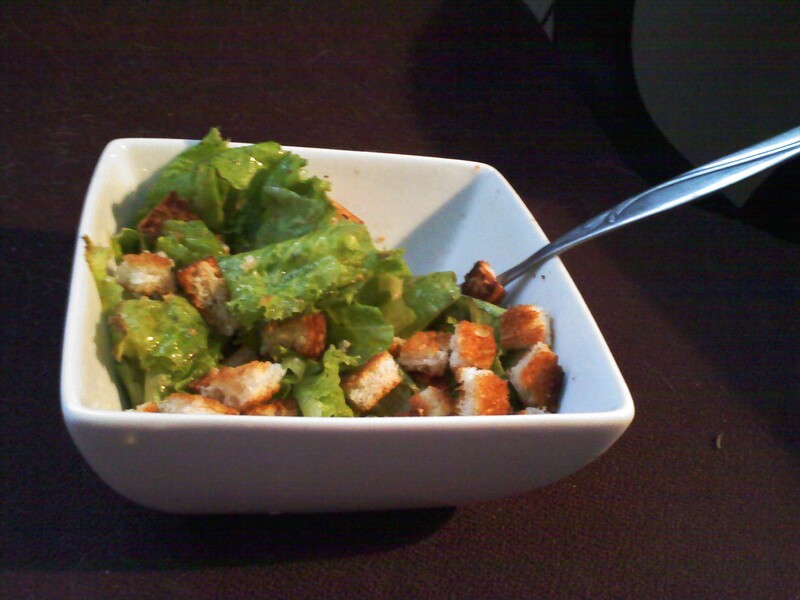 I over baked a previously frozen piece of Kroger everything bread and used that as a crouton topping. I suggest more radish and go light on ginger otherwise it was really quite good.